This page updated on-line at http://www.africafocus.org/intro-econ.php. Politicians and investors in Africa and around the world speak of creating good jobs. In practice they most often promote a market-fundamentalist development model that sheds jobs while increasing profits for the 1%. The "Africa Rising" narrative celebrating rapid economic growth in many African countries contains a partial truth. New investment in extractive industries to serve world markets is growing, and there is rapid growth in information and communication technology as well. But most Africans, whether in the rural areas or the burgeoning cities, have little access to the wealth created. Jobs in the formal sector do not come close to keeping up with expansion of the labor force. And government policies marginalize the interests of workers and small farmers. Sustainable development depends on public investment in health, education, and infrastructure, but these investments fall far short of what is needed. Significant change in economic policies, in Africa and around the world, will only come if there is active transnational mobilization for economic justice for the 99%. Such action must include not only political groups, but also unions, farmers' organizations, human rights groups, churches, and others in all sectors of society. 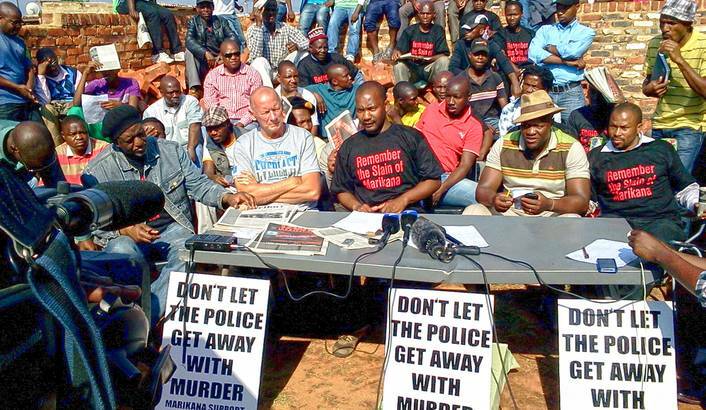 South African platinum miners organize a wildcat strike in October 2012. T-shirts refer to massacre of striking miners at Marikana in August that year.